I don’t know about where you live, but this past weekend Pittsburgh was a true delight with temperatures creeping on 70 degrees! Though we had our Saturday filled with adventures at Ikea’s BYOF event (more on that later this week! ), Sunday was spent enjoying the warmer weather in the city, complete with a picnic dinner from a few of our favorite Strip District grocers. But after such a warm spring-like day, we couldn’t come back to our wintery pine cone wreath. So I finally decided to do something with the old pool noodle I got from someone through freecycle. A quick trip to the craft store yielded these flowery finds. The forsythia was picked because it reminds me of spring in my Mom-mom’s backyard. She had a whole line of the bright yellow flowers that would be in full bloom when we were kids running around the backyard hunting for Easter-eggs. 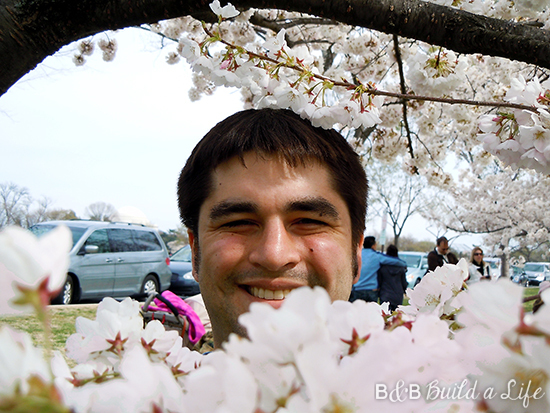 Cherry blossom sprigs were selected because they’re in many ways a symbol of DC, where Bill and I met. The dogwood blossom was a bonus find and reminds me of the tree my parents planted at the end of our driveway after the big tall evergreen fell in a bad storm and literally knocked on our front door, miraculously missing the house itself. First step was to cut and tape the pool noodle float into a wreath form. This step is easier with a good movie on. Here we are watching Flight with Denzel Washington. Seriously, do not watch Flight if you ever plan to get on an airplane ever again. Yeesh. Because the yarn I used was a lighter color, the orange of the noodle was showing through. To remedy that, I wrapped the noodle first with some old scrap sheeting leftover from the How I Met Your Mother duvet cover. Then it was on to wrapping the yarn around the noodle. I chose a soft and fuzzy muted teal color. This step takes a while, but it pays to take your time and be even about things. It also helps to stop every few inches around and add some hot glue to the back to be sure things stay put. Now it’s time to add the flowers. The original plan was to be 100% asymmetrical about things, but Bill suggested adding the red roses (peonies?) spraying out both left and right, which turned out to look really nice. So here’s where we ended up. The small detail I forgot when picking out the yarn color was that our front door is already blue, so it doesn’t pop as well as I had hoped. But for contrast, here’s the wreath against a lighter color. The cherry blossoms surround the dogwood bloom with the peony sprays out on either side from there with everything capped off with the sunny yellow forsythia spray. I’d say our apartment is ready to welcome spring now! We have a few more springtime additions to share, but those will have to wait until after we tell you about our Ikea BYOF adventure. So pretty and creative! And definitely a good springtime welcome! I love this! The bright flowers with the pale teal yarn are so pretty! Thanks! Simple it is, though more time consuming to wrap the yarn than you might expect! So pretty~ love the teal! Thanks for linking up last week on Made in a Day!